I am sickened on what happened over the last week. 360 primates sat in the cargo hold, 100 hrs without food or water. Many tied, the lucky ones. 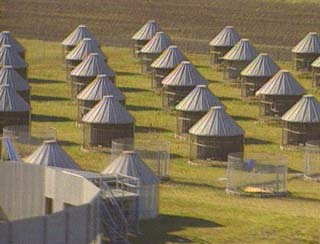 They were trucked to Covance Labs in Alice, TX for a life of hell. I need to find out more about these Covance labs and want to join anyone who will boycott the airlines and the labs. Y'all obviously aren't very knowledgeable about the primate... They have nice people there that are trying to help these monkeys. They have very nice people there and take pretty well care of those monkeys! You need to get your facts in order before you "blog" about it. have a nice day ;D You don't have to approve this comment and I'm sure you haven't approved many other good comments, but I'm just informing you "blog author"